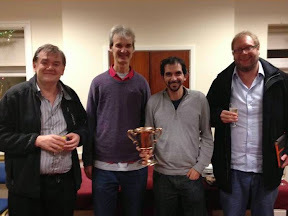 The team of Alexander Allfrey, David Bakhshi, Tony Forrester, David Gold and Andrew Robson has won the Gold Cup. The semi-finals and final were held at the West Midlands Bridge Club on 13th & 14th December. On Saturday the Allfrey team won their semi-final against the Mason team by just 6 IMPs, whereas the other semi-final was more one-sided with the McIntosh team (Andrew McIntosh, Phil King, Stefan Skorchev, Cameron Small) beating the Gillis team by 57 IMPs. The final started well for the McIntosh team, and they led by 25 IMPs after three stanzas, but the Allfrey team picked up 37 IMPs in the next two stanzas and ultimately won 115-98. The winning players who played on Sunday are pictured - Alexander did not play in the final. The runners-up are pictured here. This was Tony Forrester's 13th victory in the Gold Cup, extending his lead on the all-time list. Andrew Robson had won seven times, Alexander Allfrey six times, David Bakhshi five times, and David Gold three times. These five players have extended their lead in the Player of the Year Championship, though there are still many more scoring events left in the 2014/15 Championship Series.